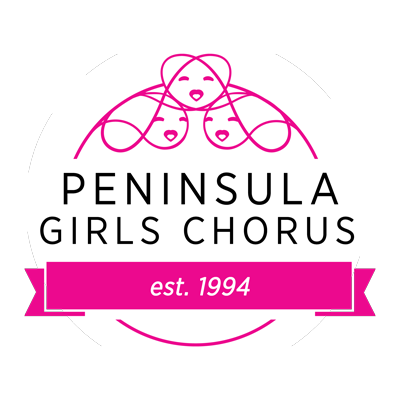 The mission of the Peninsula Girls Chorus is to engage the hearts and minds of girls from diverse backgrounds through a comprehensive experience in choral music. Our vision is that girls will live life more deeply through their involvement and participation in choral music. We believe music connects us to our shared humanity. We believe music creates a sense of shared history and journey across ages and generations. We strive for the highest standards in everything we do, individually and organizationally. We expect everyone within our organization to work to his or her potential and for what’s best for the chorus. In exchange, we will always have a place for each girl within our organization. We are committed to providing an all-girls environment that fosters confidence and leadership in each girl we work with and nurtures her belief in herself and her fellow chorus members. We explore and perform music that expresses the deepest experiences and highest aspirations of the human spirit. We believe in taking deep satisfaction and happiness in the art of teaching, learning and creating music together.